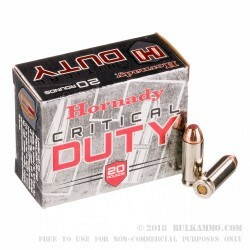 This 20 round box of Hornady Critical Duty 175 grain FTX 40 SW ammo leaves the barrel at 1160 feet per second with 523 foot pounds of energy, and is ideal for self defense in the all powerful 10mm. This powerful cartridge is the parent to the 40 S&W which has been used by many law enforcement agencies in the past. 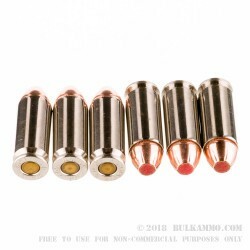 The 10mm was found to be too powerful for many handgun shooters and so the 40 was born. If you decide to use the 10mm for your self defense caliber of choice, you can't go wrong by choosing this for your carry round. The cartridge is a nickel plated brass, which is the gold standard for feeding reliability and corrosion resistance. It is a boxer primed casing so if you wanted to reload this high quality casing it would be ideal for that as well. The flex tip design of this projectile lends itself perfectly to reliable expansion, as the rubber tip keeps it from clogging when passing through various obstacles. 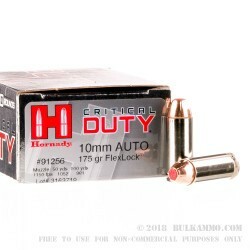 Hornady was awarded the FBI contract to supply their self defense ammo, so you know you are getting high quality at a good price by choosing Hornady for your self defense ammo. The rounds awarded the contract were the “Critical Duty” line in 135 grain, which are designed for better barrier penetration.